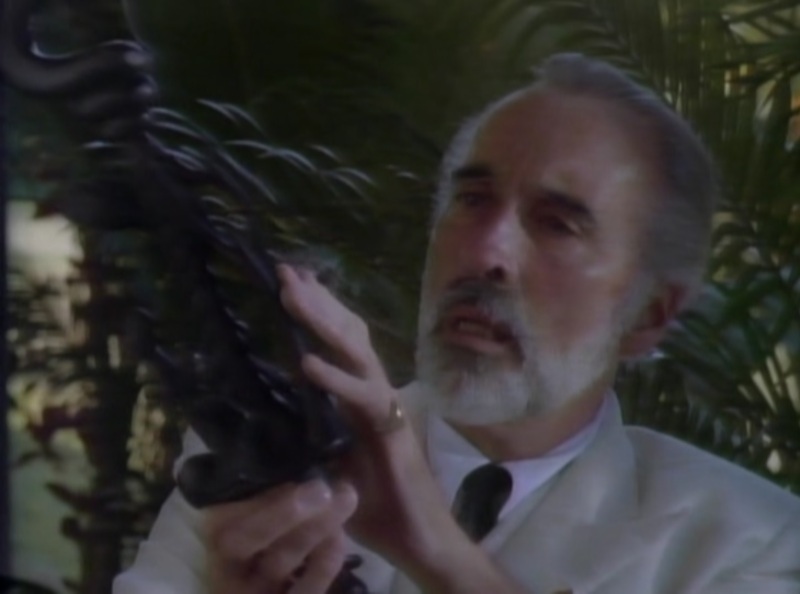 I used to think Christopher Lee was badass in everything… then I saw Curse III: Blood Sacrifice. I can’t hold it against him, though, as everything in Curse III is less than it should be. On paper I’m sure this one looked like it had potential, and Christopher Lee is in it? Well yeah, sure, here’s a sack of money; go make a movie! But what resulted was less movie and more insomnia cure. One of the worst things about Curse III is that its plot can be summarized completely in one sentence (and that’s without exaggeration). Here goes: The American wife of a sugar cane farmer in Africa angers the local witch doctor, who curses her entire family to die by way of an ancient ocean spirit. There’s definitely potential for a fun horror movie there, but Curse III sidesteps every opportunity and runs screaming in the opposite direction. A simple premise is fine, but without an engaging story the audiovisual aspect of the film — the filmmaking itself — must grab the audience and shine. Director Sean Barton may have many credits as an editor (including Return of the Jedi! ), but his talents as a director are severely lacking. Unsurprisingly, Curse III is his only directorial effort. So without a good story or filmmaking, what else does an audience have to hang their hope on? If the characters are loveable, interesting and fun to be around they can make up for a lot of other shortcomings. The characters of Curse III might as well all have been gravediggers because all they did was dig a deeper hole. Our lead is Elizabeth (Jenilee Harrison), the aforementioned farmer’s wife. She has recently emigrated to Africa to be with her husband (no word on how they met), and she’s not hip to all the cultural differences. So when the foreman drives Elizabeth, her sister and her sister’s boyfriend to the local tribal village (for no good reason), and they see that a goat is about to be sacrificed, the Americans are shocked. Elizabeth wants to stop it from happening, but the foreman stops her and says it’s an important ritual that she shouldn’t interfere in. Duh. But her sister is in the truck bed and didn’t get the memo, so she jumps out and grabs the goat. Obviously this is a dumb move, and the witch doctor does a creepy dance and yells at them in African. I already didn’t like these characters, so at this point in the movie I “switched sides” and actively rooted against the dumb Americans. Cultural insensitivity is annoying at its least offensive, and truly damaging at its worst. So these dumbasses were merely getting what they deserved! Maybe the witch doctor was a little over the top in sending a resurrected ocean spirit to kill them all, but maybe that’s just me being insensitive to how insulting their affront was. But as boring and forgettable as Curse III is, it is not without some small delights. For some reason, every time Elizabeth wanted to comfort herself and forget how fucked up things were, she’d chant to herself, “America, America, America.” Huh? If she’s hoping to magically whisk herself home she’s going about it all wrong. It’s “There’s no place like home,” Elizabeth; Dorothy didn’t go anywhere with “Kansas, Kansas, Kansas.” But her insane coping mechanism was at least funny to me. Also funny was the Grandma who says, “I’ll take care of this,” while loading a double-barreled shotgun. She’s not as badass as that makes her sound, but that shotgun does eventually blast the creature out of a second-story window, so that’s something. There’s also a quick unintentionally funny moment where Elizabeth gets tired of holding the shotgun up while Christopher Lee tells a long-winded story. It’s almost like an outtake or something. The whole movie just stops for a few seconds while she struggles with the gun, and Grandma asks if she’s OK. Judging by her can-do attitude, Grandma could have easily wielded the shotgun, but for reasons I’ve forgotten she handed it off to Elizabeth. Whatever. 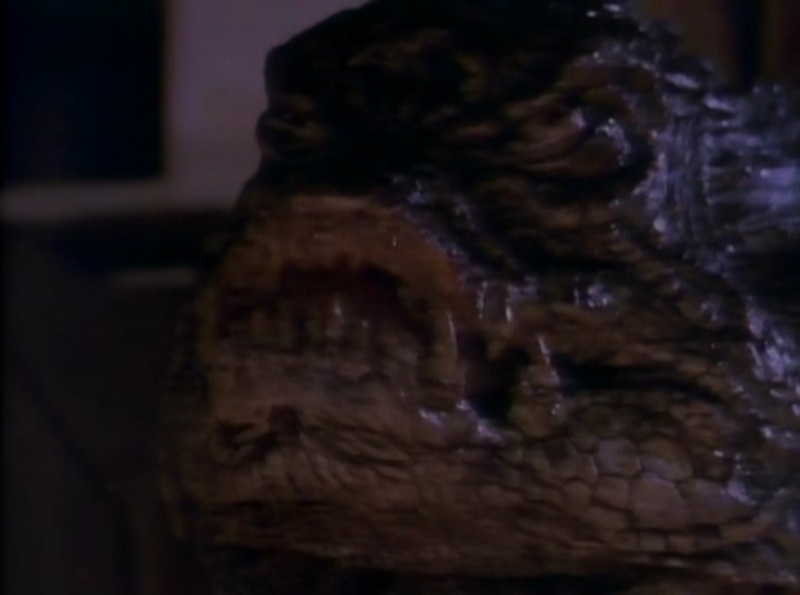 The funniest and by far the most lasting thing I’ll take away from Curse III is the creature that appears at the end of the film. It’s the physical manifestation of the ocean spirit invoked by the witch doctor and it looks like a cross between a fat gremlin and a Power Rangers “dude in a suit” villain, and in a way it also kinda resembles a man-sized kaiju creature. This is too low-budget of a movie to show him much, but the flashes you get are pretty funny. His death is the best, though. Elizabeth is trapped inside a shed or something and the creature is trying to get in the front door. She opens a gas can, pours it out in the middle of the room for some reason and then goes to light it while she slips out the back door. BUT WAIT! The creature is now at the back door, so Elizabeth goes back to the front door and lights the middle of the room up as the creature comes in. And then, in a show of mercy, the creature apparently got tired of his struggle to kill Elizabeth (and presumably of the movie itself), so he literally just steps into the fire and stops walking. It looks hilarious and it sounds like the creature is just dumb, but I think I have an explanation. The creature is just the ocean spirit inhabiting a body. The fire won’t actually kill him, just his temporary body. Where he found this Power Ranger Fat Gremlin™ body, I don’t know, but just go with it. So the body is dead, and the spirit just returns to the sea and waits for the witch doctor to resurrect him again the next time some other clueless American does something culturally insensitive. So yeah, he won’t be waiting long! Stay away from Curse III, though, the laughs that you do get are not nearly enough to justify watching it. Unless you’re into that sort of masochism like I am. Oh, and I can’t finish this review without mentioning that while Jenilee Harrison was fun on Three’s Company (one of my favorite shows), in Curse III she’s just awful. She comes off like the worst, no-talent horror actress you could imagine, making a boring, hard-to-sit-through movie even worse. Ugh. OK, enough about this one. Hopefully the next Curse sequel (that’s actually not a sequel) is better. If nothing else, it’s the last one! Next time I get around to a Full Moon movie, I’ll be checking out an actual Full Moon movie: David Schmoeller’s 1988 film Catacombs, which wasn’t released in the US until 1993 under the title Curse IV: The Ultimate Sacrifice! See, this was all leading somewhere! See ya then!